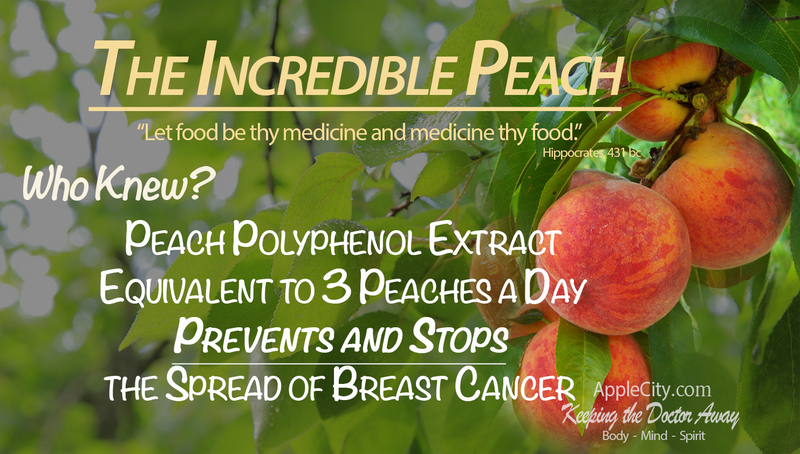 Home / Peaches Stop Breast Cancer Metastasis – Who Knew? (NaturalHealth365) Three peaches a day can prevent cancer, in fact, it induces metastatic breast cancer cell death, says food science researcher Giuliana Noratto at Washington State University. Professor Giuliana Noratto in concert with researchers at Texas A & M said that when exposed to polyphenol chemicals in peaches, cell signals become activated to “drive them to commit suicide”. If you want to do your own research, Noratto and her team’s findings were published in the Journal of Nutritional Biochemistry and The Journal of Agriculture and Food Chemistry. Breast cancer is the most common cancer among woman living in the United States and cancer-related deaths. Naturally, Noratto and her team’s findings offer a practical and simple addition to every woman’s daily routine intended to prevent cancer. The equivalent of the polyphenol peach extract used in the study was equivalent to a 132 pound woman eating approximately three peaches per day. To test the effects of peaches on breast cancer cells, mice were injected first with breast cancer cells, then fed varying doses of the peach extract. After the mice fed high levels of the polyphenol chemicals extracted from peaches, researchers observed slow-growing tumors in these mice. After 12 days, researchers observed that rats fed the high levels of peach polyphenols experienced less formation of blood vessel activity that is responsible for the spread of cancerous cells. Less enzymatic activity involved in both the invasion and spread of cancer was also observed. While many conventional oncology teams still rely exclusively on harsh synthetic chemotherapy pharmaceuticals, Novatto and her team stand apart, setting the bar high for the future of evidence-based food therapies that prevent and treat cancer effectively. Peaches, considered to belong to the “stone fruit” family because of their large stone-like seed, contain potent polyphenol activity known as chlorogenic and neochlorogenic compounds. While these compounds are present in other stone fruits, they are of particularly high concentration in peaches. Novatto’s studies have confirmed that these two polyphenols are the compounds responsible for killing cancerous breast cells. Unlike giving body taxing, high-dose chemotherapy to patients that is not cellularly-selective (kills healthy cells along with atypical cells), researchers are positive about offering high-dose peach extract without the associated side effects. This is really good anticancer news for everyone. Beyond breast cancer, researchers found in further animal studies that the polyphenols prevented other cancers from continuing to grow, making them a practical anti-cancer food therapy. Never underestimate the healing power of natural foods. About the author: Christine M. Dionese L.Ac, MSTOM is an integrative health expert, medical journalist and food writer. She’s dedicated her career to helping others understand the science of happiness and its powerful effects on everyday human health. Christine practices, writes and speaks on environmental functional medicine, personalized medicine and epigenetics, food science and sustainable living.